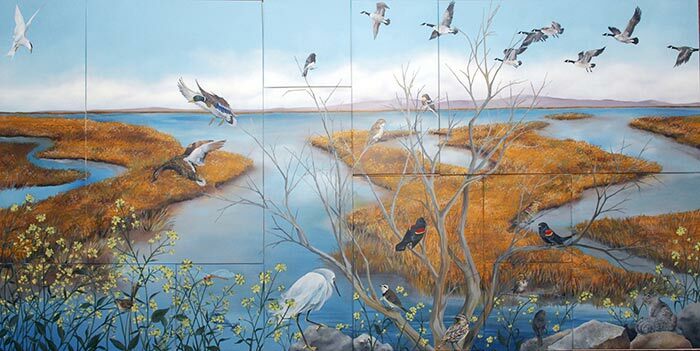 Jean Bidwell, muralist/fine artist paints Geese represented in 8′ x 4′ mural [ SOLD ] at the Hayward Shoreline Interpretive Center. The 360° Series is a collaboration with Kiersten A. Stein, inspired by the flora and fauna of the shoreline where Jean converts Kiersten’s photographic perspectives into watercolors: Museum Quality Archival Limited Editions will be represented. Utility box tribute to Classic Rock: Musicians/Songwriters featured: Santana, Janis Joplin, David Bowie, The Beatles, Melissa Etheridge, Roy Orbison, Pink Floyd, Elvis, Van Morrison, Little Richard, Neil Young, Eric Clapton, The Who, Rolling Stones, Jimi Hendrix, Bob Dylan, Tom Petty and the Heartbreakers, Led Zeppelin and the Rock and Roll Hall of Fame.